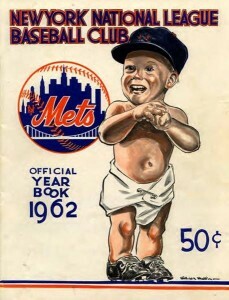 My Dad, a lifelong Giants fan got the tickets for opening day at the Polo Grounds where he, as a kid himself, watched some of the all time greats play there in the ’30s through the ’50s. 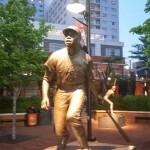 He was my hero and at 17 I was not ashamed to tell anyone that I got my love of baseball and life through him. Little did I know that in a little more than two years later he would be gone from me forever. 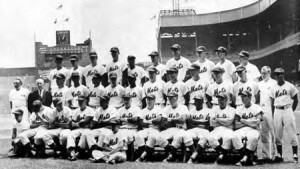 The 1962 New York Mets were primarily a collection of former stars past the prime of their careers. I was so excited because the weather forecast for the Mets opener said mild and sunny with high’s in the upper 50s with zero possibility of rain. I awoke early knowing that I would be at the game in a few hours and I was happy to miss a day at school. Hell I was a senior, I had been accepted at Northeastern University in Boston as well Albany State College and Long Island University in Brooklyn. I was holding out for my first choice, Syracuse University but I knew I had to make a decision soon. Back to the weather. When I awoke around eight it was raining like cats and dogs and the revised forecast was forgetaboutit, the game was postponed by 11:00AM. Now what? Game two, scheduled for my birthday, was not a sellout so that hero of mine made a couple of calls and told me all was well and we would still be able to catch an opening game-day to remember. I now see where this is going so I have decided this will be way too long for one single article, so I know pronounce this a “series” with I’m not sure how many parts, so please if you love baseball and the Mets in particular, bare with me. So on April 11 1962, my Dad and I got on the D train and headed into “the city” to Meet the Mets. The 1962 team came about as each National League team left a few unprotected players which the Mets and the Houston Colt.45s would chose from. These were not front line players by any stretch of the imagination and the two clubs differed on how they would stock their team. 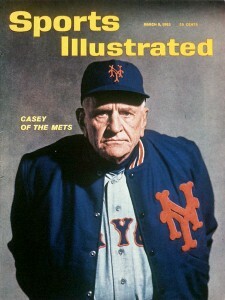 Former New York Yankees manager Casey Stengel was given the task of trying to turn the rag tag Mets into a baseball squad. The Houston club would stock their team with young, unproven and not well known players. Given this was Houston’s first time in the majors it made perfect sense. The Mets were owned by Joan Payson and George Weiss, the man who built the Bronx Bombers of the ’50s and ’60s, was the Mets first general Manager. Weiss knew that by bringing in former Dodgers and Giants despite the fact that they were well past their prime would draw fans to Coogans Bluff. Little did I know at the time that this first stroke of lousy ownership and General Manager ineptitude would be the stamp placed on this franchise that still permeates today 48 years later and the reason behind the motive to chronicle this series. Former Brooklyn Dodgers on that 1962 Mets team. Don Zimmer, Roger Craig, Charlie Neal,and Clem Labine. Former New York Giants included, Hobie Landrith, Ray Daviault, Johnny Antonelli, and Joe Pignatano. 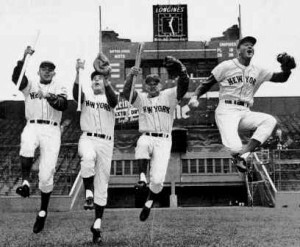 The starting lineup for the 1962 New York Mets. Now if this were the lineup say five to seven years earlier they had some fine all stars in this group loaded with speed and power and decent defense. I think the average age was around 48 or so, at least it seemed to me that day. Did I care? no. With a hot dog in one hand and a Needix Orange Drink in the other I felt as alive as I have ever been. When you lose 120 games you can't take anything very seriously. The game itself was over before I knew what I had to eat. The Mets lost and another eight straight after that. As so many fans know, they went on to lose 120 games that year and I was 1-8 but couldn’t care less. If I remember correctly that year, I saw Willie Mays, Willie McCovey, Juan Marichal, Don Drysdale, Sandy Koufax, Roberto Clemente, Eddie Matthews, Ernie Banks, and Hank Aaron. Not too shabby at all. I was turned down at Syracuse and decided to go to Northeastern University in Boston. Early that fall of 1962 I got to go to Fenway Park for the first time and was completely blown away. Love at first sight. We welcome Richard Marsh to the growing collection of talented writers supporting Sports Then and Now. A die-hard fan of the Mets and Jets, Richard is the author of “The Blog” From Vegas Rich and is also a featured contributor on Bleacher Report.